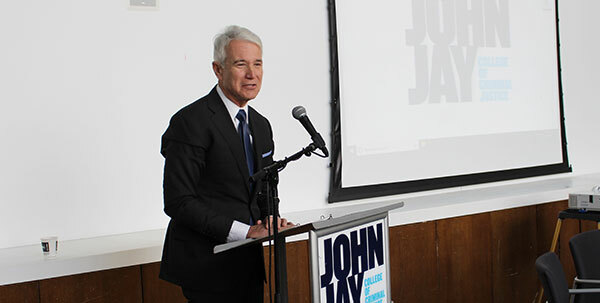 Each year, researchers, scholars, policymakers, and journalists come together at John Jay College to discuss current criminal justice issues, offer up suggestions on policy change, and deepen the public’s understanding of the criminal justice system. This year was no different. The 14th Annual John Jay/Harry Frank Guggenheim Symposium on Crime in America, held on February 21 and 22, focused on the theme of “Violence in America: Myth & Reality,” and discussion topics included: gun violence, the growing opioid crisis, and court reform. Dan Wilelm, President of the Harry Frank Guggenheim Foundation. Stephen Handelman addresses attendees and those watching the symposium via livestream. San Francisco DA, George Gascón delivering his keynote address. From left to right, Larry Obhof, Ohio Senate President, Mark Holden, General Counsel of Koch Industries, Holly Harris, Executive Director of the Justice Action Network and Bill Keller, Editor of The Marshall Project. The first day also included a special panel, moderated by Bill Keller, Editor of the The Marshall Project. The panel analyzed the impact of the Midterm Elections on criminal justice reform. Panelists included Holly Harris, Executive Director of the Justice Action Network; Mark Holden, General Counsel of Koch Industries; and Larry Obhof, the Ohio Senate President. The panel discussed the importance of bipartisanship in the effort to bring the First Step Act to fruition. The Act was signed into law December 2018 and is considered to be one of the most significant criminal justice reform bills in years. “We’ve never, ever, in the history of the federal system had a comprehensive bill that made things less punitive, and more redemptive and restorative. It’s a big deal. And, it’s an even bigger deal given our fractured politics and hyper partisanship,” said Holden. 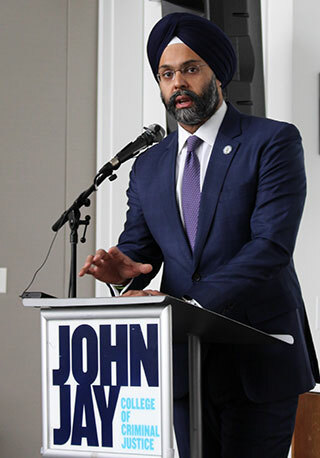 The Attorney General of New Jersey, the Honorable Gurbir S. Grewal. The second day of the symposium included a special keynote address from the Honorable Gurbir S. Grewal, Attorney General of New Jersey. “What I want to address is the Trump Administration’s reliance on and perpetuation of myths and lies that support their nationalist agenda, which in my mind, is undermining public safety in this country,” said Grewal. He cited the Administration’s distortion of facts as a way of creating a false narrative, meant to create fear. “As I’m sure you’ve already discussed during the course of this symposium,” said Grewal, “the federal government’s own data, their own numbers, show that violent crime in the country has fallen sharply over the last 25 years.” He added, “The Administration offers a completely different narrative. They warn of American carnage. They say that America is unsafe. They say that the only way to keep us safe is by building a wall, and they say that the only thing protecting, quote, real Americans, is a tough, harsh brand of justice. One that is heavy on intimidation, but light on compassion.” He then encouraged the journalists in the room to keep up their investigative work with vigor, “You all are doing meaningful, important work. It is change provoking work, that I think is needed more today than ever before,” said Grewal. 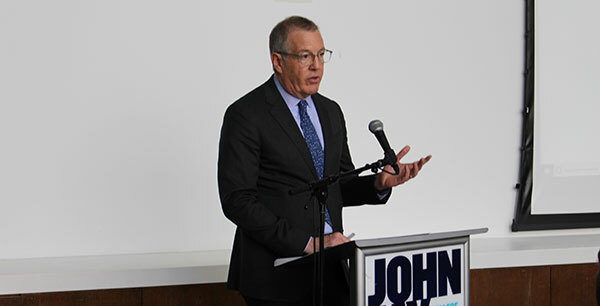 Capping off the symposium was the award presentations of the 2019 John Jay/Harry Frank Guggenheim Excellence in Criminal Justice Reporting Awards, presented during the 2019 Justice Trailblazers Awards Dinner.